I'll be honest. I don't read many blogs. I simply do not have time. One blog that I do read on a consistent basis is The Flying Kayak. Alex has some wild outdoor adventures and does a great job of writing about them. I always look forward to his next post! I was thrilled when he asked to write a guest post for me. Enjoy! 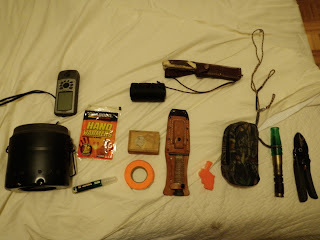 I was inspired a few weeks back by Tim at The Unlucky Hunter to do a post on what I carry in my pack. 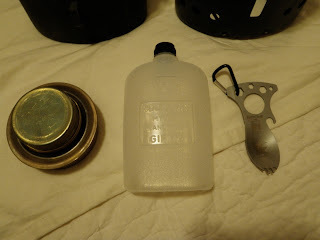 After reading his post, I decided to clean out my big hunting pack (the one I carry for all-day hunts), and limit it to –just- the things I need. The following picture is everything that I carry with me into the woods for an all day hunt minus food and water (those get added before each hunt). It’s important to note that my definition of an all day hunt isn’t: Climb into the stand in the morning, get down around 10, go to the truck, drive around, eat lunch, get gas, stall until 2:30, then climb back into the tree. 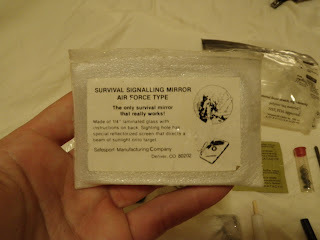 This pack is what I carry if I plan to enter the woods in the dark, and not leave until it’s dark again. You will see redundancy in the pack and I feel that’s important…Especially with things you can’t afford to lose. 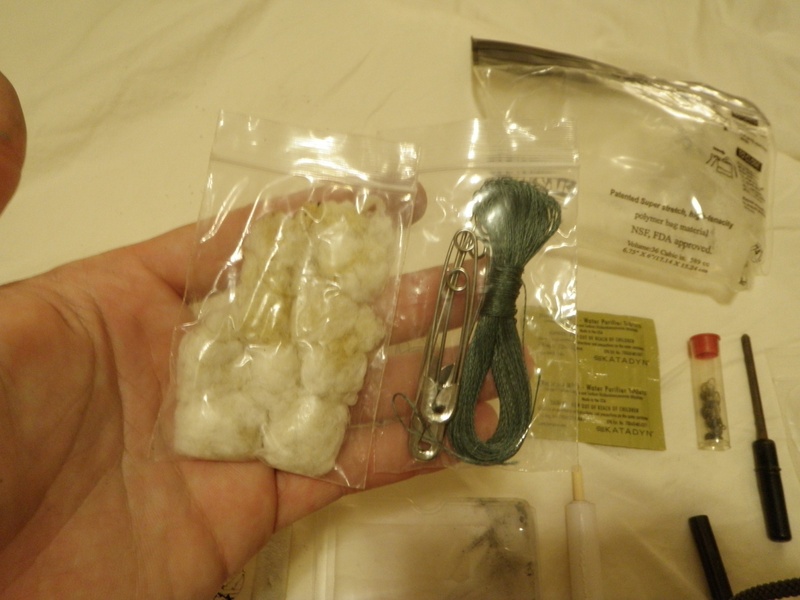 Some toilet paper, and a travel sized first aid kit are carried as well (not shown). 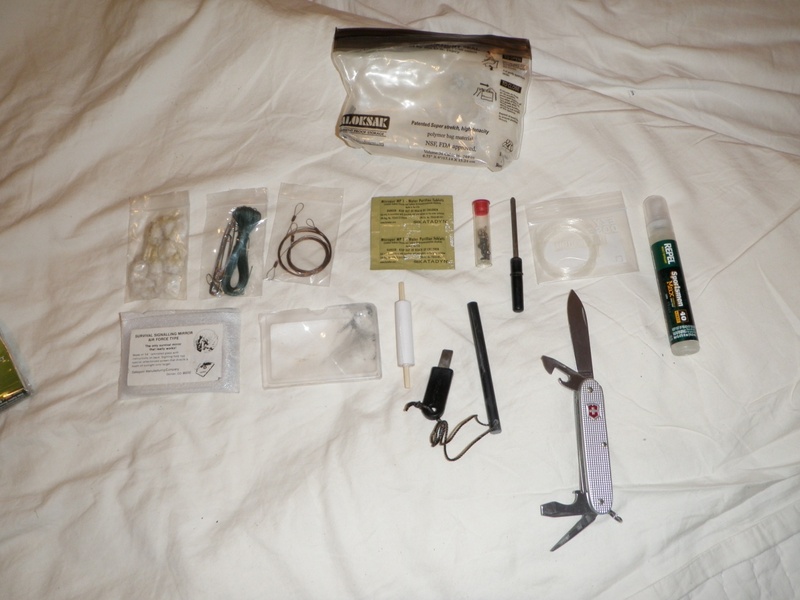 I’m relatively extremely accident prone, so the first aid kit travels from hunting pack to tackle box quite often. Additionally, there’s enough room to put a lunch inside such as instant rice and a can of Vienna sausages (the lunch of champions…I know). 2. 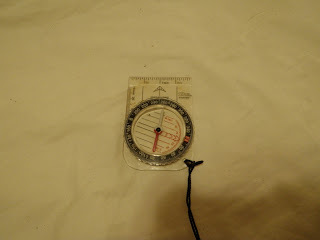 My GPS is something I like to carry with me, especially during scouting season. It’s very nice to be able to enter a waypoint for a good looking deer trail or rub line, and then cross reference the coordinates back home on google earth. One –vitally- important thing to note about GPS’s in general is that they lose satellite signal relatively easily. All it takes is for one to walk into a very thick area of woods, or be surrounded by a lot of big trees and the next thing you know: No Satellite Reception. A GPS can be a valuable tool in the woods, but it certainly isn’t one to be relied on heavily. Always carry some other tool for navigation. 3. Handwarmers are something I enjoy having during Florida’s brutally harsh winters. It’s nice to keep the fingers toasty. Always remember that they have an expiration date. Practically willing a hand warmer to heat up isn’t a fun way to spend a morning in a tree stand. 4. 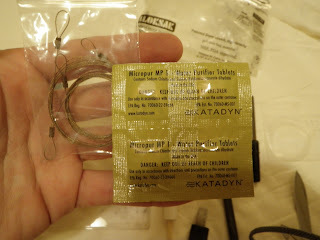 The roll of tarred net twine is something I began carrying with me fairly recently. I substituted it for para-cord. I won’t be going into details for all the different ways one can use this material simply because there are too many. As a general rule: If a situation requires a form of twine, the tarred net twine will work. 5. 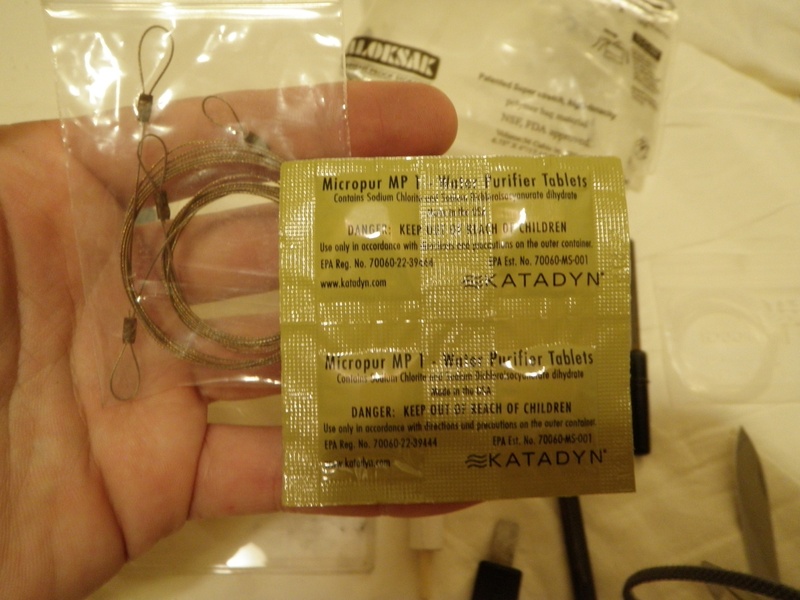 The box of reflective tacks is useful just about every deer season. 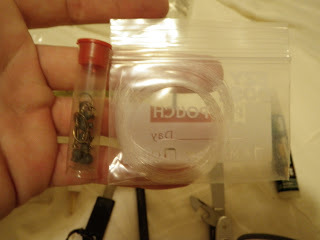 I carry the tacks in a box because…well…Imagine carrying them in a plastic bag. Stick them on a tree to mark your trail into and out of the woods in the dark. When you shine a flashlight, ‘ta-da’, you now have a glowing trail. I like to stick them on both sides of a tree. In addition, I like to use something similar to driving hand signals with the tacks when marking a trail that twists and turns. For a left hand turn on the trail, place two tacks directly next to one another horizontally. For a right turn, place one directly above another. 6. The marking tape serves the same purpose as the tacks do…just in the daylight hours. One can also pace out distances around a stand and hang a little tape if you don’t have a fancy range-finder. 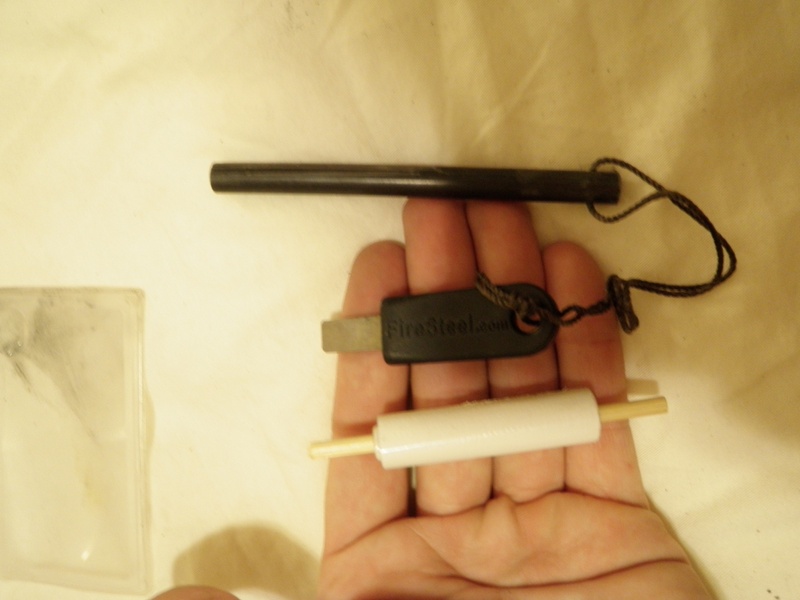 The pilot’s knife comes with a sharpening stone and is used as a sort of “do-all” knife. The Puma skinning knife is used just for skinning animals. 8. I carry an emergency whistle with me because…well…If it could be useful on a boat for rescue, I figured it would work well in the woods too. My dad made it for me a few years back. 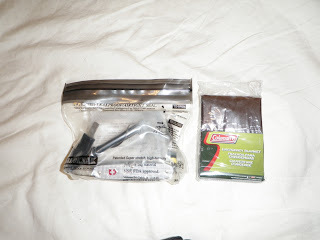 Inside there are three items: A compass, emergency blanket, and the actual ‘kit’ in a waterproof bag. 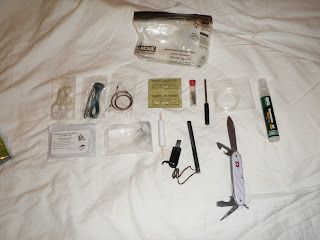 Carrying the survival kit in my hunting pack gives me quite a sense of security. 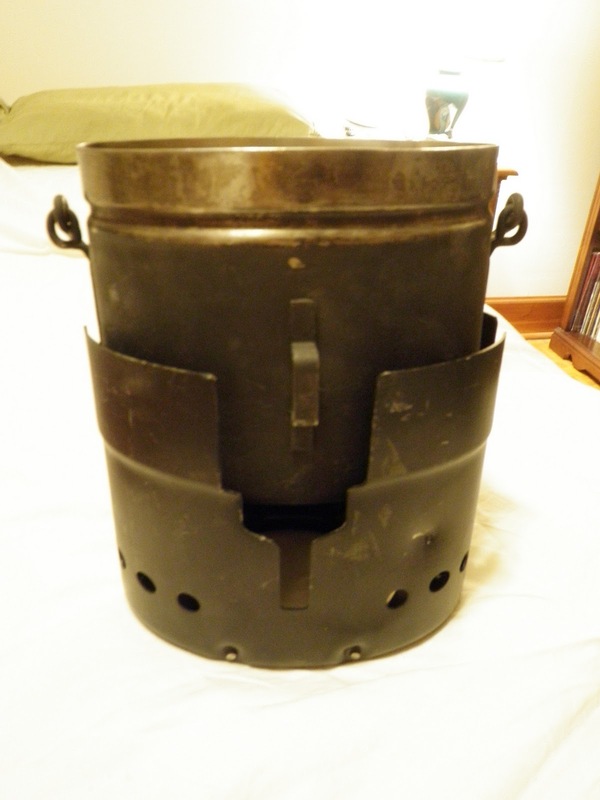 I know that if something were to happen, I have a means to make fire, secure food, and be rescued. 10. 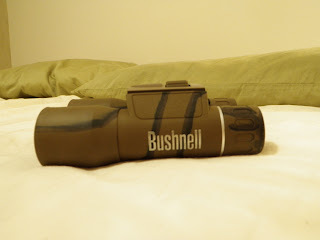 The 3-in-1 deer call is something that I actually use a lot. I’ve called several deer right to the stand in the past with this call. It has settings for a buck grunt, doe bleat, and fawn in distress. I think it’s getting to be time for a new call though. The fawn in distress call no longer sounds like a fawn in distress. It sounds more like a fawn being choked to death…which I guess is still distress, just not the right kind of distress. 11. Clippers are a valuable tool in my hunting pack. I use them to clear the trail to and from the tree stand so that I can enter it more quietly. It’s also very nice when stalking because you can silently clear out brush that would otherwise be the noisiest thing ever encountered during a stalk. 12. 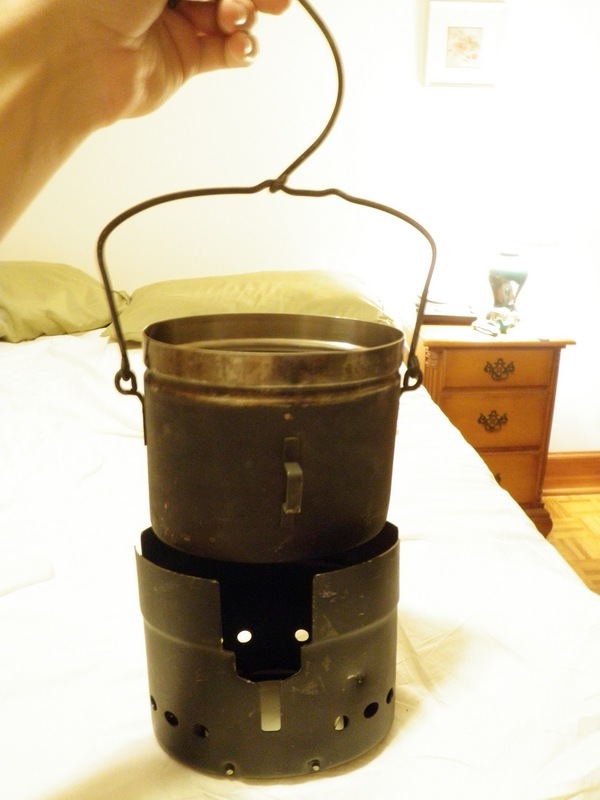 Bug repellent in the final thing I carry with me in the woods. 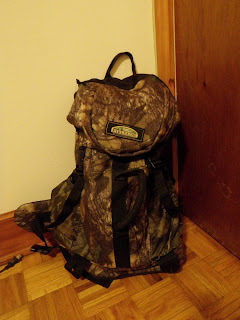 Now I’ve forgotten nearly every piece of hunting equipment that needs to be carried from time to time. Ammo, food, water, compass, hunting license…You name it, it’s been forgotten before. But bug repellent in the only item that has caused me to wish for a swift death if forgotten. It’s practically a necessity. 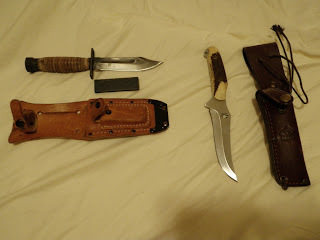 Overall, I’m happy with what I carry in my hunting pack. It has evolved over the years, and I’m constantly adding/subtracting things that I think I need/don’t need. There are plenty of things that get added right before I leave for the woods that are just situational. In archery season, I’ll often just go out in short sleeves. But in the dead of winter, I make sure to throw an extra sweater or sock hat into the pack before I leave. Additionally, ammunition will often make its way into the pack depending on the season. Other things that I find necessary for the woods are not carried in the pack, but rather, on myself. 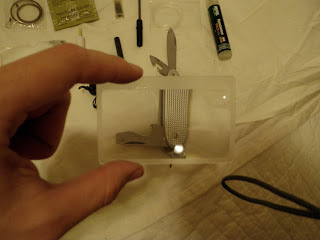 Things such as a multi-tool or flashlights are carried on me much like my wallet or keys. You never know all the things you’re going to need when you enter the woods, but I think my pack has me pretty well covered.